This is a three-session swim camp focused on essential details of racing fast at the end of the season. On Saturday there will be one session for swimmers ages 11 and older (Session 1 – Breakouts) working on underwater dolphin kicking, breakouts, finishes, and mental strength. Then on Sunday, there will be two sessions. Session 2 (Turns) is for swimmers ages 11 and younger on flip turns, open turns and streamlines. Session 3 (Transitions) is for swimmers ages 12 and up in which the focus will be on flip turns, open turns, and IM transitions. Your Elite Clinician for this camp will be two-time Olympian Chloe Sutton. Not only is Chloe one of the fastest swimmers in history, but she is also one of the most experienced and requested clinicians with Fitter and Faster. Scroll down for more details on the curriculum! Chloe Sutton will be in the water leading 3 sessions. 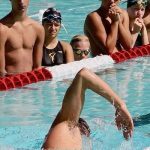 These sessions are designed for competitive swimmers with at least one year of competition experience. We do not recommend this clinic for swimmers younger than 8 years old. This session is all about focusing in on the most important details that are often overlooked at the end of the season by swimmers! Two-time Olympian Chloe Sutton will work with participants to feel more power in their underwater dolphin kicking, accelerate into the breakout, and create maximum extension at the finish. She'll also go over mental strength so that your swimmer can have the right mindset when they step up on the blocks at their big meet. BREAKOUTS: Maintaining a tight streamlined position as your swimmer accelerates into the breakout is extremely important in transferring the momentum from the dive or pushoff into the rest of the length. Chloe will help swimmers feel keeping their head down and core engaged as they take their first stroke to to make a big difference in their breakout. MENTAL STRENGTH: More often than not, the thing that makes the biggest difference in a swimmer's performance sits right between their ears. Help your swimmer find the right attitude and more confidence so that they can race faster! Chloe Sutton has been through the ups and downs of the sport and competed at the highest level. She has tips and tricks to be in the right mindset on race day. Races are often won and lost because of the quality of turns and streamlines of the competitors. Many people don't realize this, but the push-off and streamline from the wall after a turn SHOULD BE the fastest a swimmer will go while in the water other than the streamline after a dive. Even elite level, swimmers often add in extra movements on their turns and finishes that slow them down and even cause them to lose races that they could have won. At these sessions, two-time Olympian Chloe Sutton will work with each participant to maintain their momentum at these key points in a race. STREAMLINES: A good streamline is more than just putting your arms together over your head; it's a full body exercise! From fingertips to toetips, a swimmer must find maximum length and strength through their entire body in order to move through the water with minimum resistance. This will allow each swimmer to go faster during every start and turn without spending any more energy! The turns are often a swimmer's biggest opportunity to drop time. When changing direction, a swimmer naturally will allow their body to add in movements that create drag and slow a swimmer down. In flip turns, open turns, and IM transitions, the key is compression and maintaining momentum before getting into an efficient pushoff position. Even the smallest adjustment can make a big impact on a swimmer's times. FLIP TURNS: Swimmers at this session will work on accelerating into the wall and then sending their momentum through the flip turn. Chloe emphasizes the proper arm movement to minimize drag, maintain the correct depth, and get through the turn with more speed and power. In a proper flip turn, if you blink, you'll miss it! OPEN TURNS: The open turn is often done incorrectly due to the fact that the technique required to have a fast open turn is not intuitive. Chloe will teach swimmers how to spin backwards instead of turning around and to get their breath at the very end of the turn, not the beginning. Through drills and exercises that reinforce proper technique, participants at this session will be able to get through each turn faster. IM TRANSITIONS: The crossover turn is the fastest way to transition from back to breast in an IM race. It has made headlines lately with even the top swimmers getting disqualified for doing it incorrectly. Olympian Chloe Sutton will ensure that participants are aware of the rules and able to execute the crossover turn FAST and EFFICIENTLY.